In early March 2016, WellShare International’s Community Health Organizer, Adar Kahin, received a phone call from Somali radio, KALY 101.7 FM inviting her to discuss a topic of her choice. Adar, who spends half her time on the East African Smoke-Free Program, decided to use the opportunity to educate the public about the dangers of tobacco and shisha. She explained the pervasive tobacco problem in the Somali community, how buildings can go smoke-free, and also explained and emphasized the harms of secondhand smoke. She spent a majority of her time focusing on shisha, as this is a rising issue among Somali youth. “Young people stay out until 5am, and then they drop out of school. They cannot go to school the next day if they are coming home so late!” Adar explained. 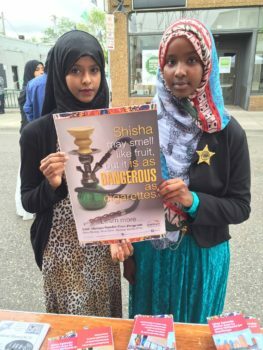 Many Somali parents are concerned about their children dropping out of school or ending up in trouble with law enforcement, but are unaware of their children using shisha; Adar ties these issues together saying that one could lead to the other. “These kids call each other saying ‘let’s meet up at this shisha place tonight! see you there!’ and even innocent kids go to socialize and end up learning harmful habits. Parents have no idea; they think their children are going to their friends’ houses and not to these shisha lounges.” Youth that smoke shisha often pass around the same pipe, leading to a rise in communicable diseases like tuberculosis and hepatitis B.
Adar received many comments from callers that dialed in to the radio show. Many were parents who thanked her for educating them about these issues, in particular, shisha. One caller said, “We are not drinking alcohol, our alcohol is tobacco!” to which Adar explained that tobacco is more addicting and very harmful for one’s health. She told listeners that if they were interested in quitting, that they could go to their clinic, speak with their health care providers, and obtain gum, lozenges, patches, or prescription drugs. 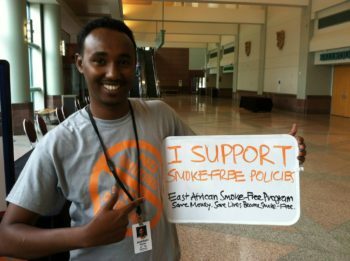 Adar hopes to go back in a few months to educate more people about tobacco, shisha, and other issues.